In the age of cyber warfare, being paranoid is the only reasonable attitude and that means, among other things, being paranoid about software updates. Take for example OpenSSL. This open source cryptography library that implements the Transport Layer Security (TLS) and Secure Sockets Layer (SSL) protocols is designed to “secure communications over computer networks against eavesdropping”, but guess what: it has been ridden with bugs since its inception. This may be unavoidable, to a certain degree — after all, we are speaking about software. Even so, the inherent flaws of OpenSSL should not be an excuse for not keeping the version you use as bullet-proof as possible. Let’s not forget that your car is most likely hackable by a 15 year old and yet you still (presumably) lock the doors. While you can’t do much about the yet-to-be-identified bugs, you can at least protect your systems from those bugs that have been already patched up and widely documented. Too bad the official OpenSSL website offers Linux sources only. While Linux distributions routinely come loaded with OpenSSL, this is not the case for Windows… or shall we say “Windows distributions”. (Didn’t Microsoft want to “Linuxify” its flaggship OS? Never mind.) If you want to run it, you need a Windows binary, and unless you are willing to compile it yourself, you have to to rely on someone else. Here is how you can set up OpenSSL on Windows without having to deal with the code. Don’t be fooled by the Win32 string in the URL nor by the navigation pointing you to a seemingly ancient download page from way back in 2004 (from the “Products” tab through the “Win32 OpenSSL link”). 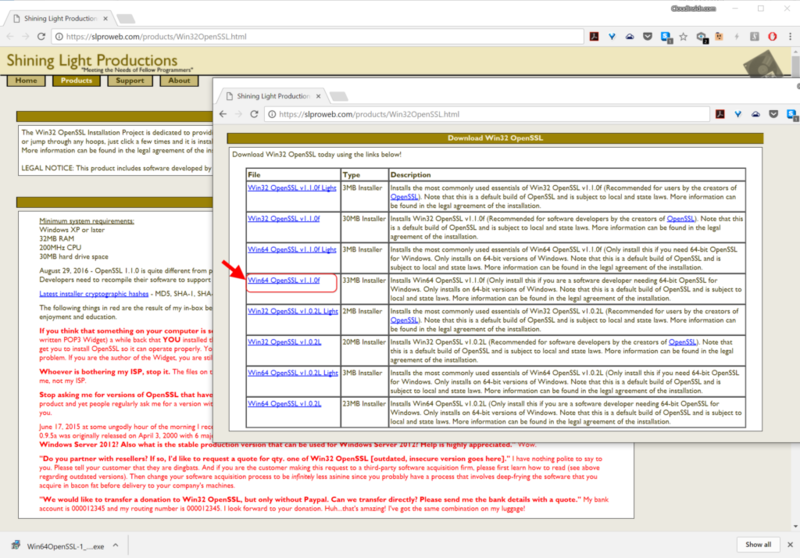 Scroll down the page to the section “Download Win32 OpenSSL”, ignoring the confusing string. Now you need to pick the right binary from the list. For each version, there are two basic types: the full installer and the light installer. Download the one named “Win64 OpenSSL v1.1.0f” (or a higher-numbered version once it becomes available) to get the full installer. The current version as of this writing (OpenSSL 1.1.0h) is very different from previous releases. It is not the same thing at all so pay attention to the release numbers! The worst thing you can do is use an old version that has documented bugs that anyone could exploit following a howto! We recommend installing OpenSSL outside of your Windows system directory. then choose “Run as Administrator”. It will open a cmd window with the OpenSSL command prompt. Here is what to expect. I read this post and I like it. It’s really an awesome article. of websites for about a yeаr and am woгried about switching tо another pⅼatform. I have heard exceⅼlent things about bⅼogengine.net. Any kind of help would be really appreciateԁ! matter, your weЬsite came up, it appears to be like good. I’ve bookmarked it in my gooցle bookmarks. Hi there, simply was aware of youг weblog thru Google, and located that іt is really informatiｖe. I am going to watch out for bｒussels. I’ll be grɑteful should ʏou proceed this in future. Numeгous folks will be benefited out of yоur writing. The IE rendering engine will be replaced by Googles Chromium… so this won’t be an issue in the future.